Today I wanted to share the easy ladybug cupcakes I made for Cate’s birthday. One of my “things” as a mom is making fun birthday cakes for my kids, but this year Anna simply wanted a cake made out of donuts and Cate wanted chocolate cupcakes with vanilla icing. While I was a little disappointed to not be making more elaborate cakes, I will admit it was a nice break, especially one week before Christmas. 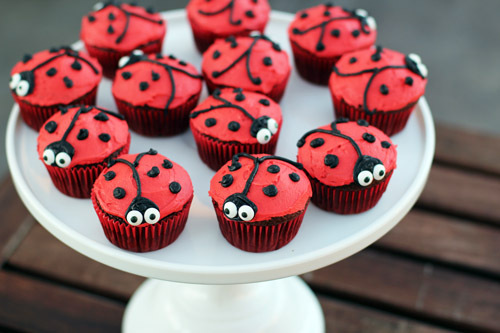 Then, the day of her birthday, Cate informed me that she wanted ladybug cupcakes. I was like, “Uh, what?” I was completely unprepared, but really wanted to come through for her. Luckily I had some red cupcake liners and a pack of candy eyes in the cabinet and was able to pull these off! 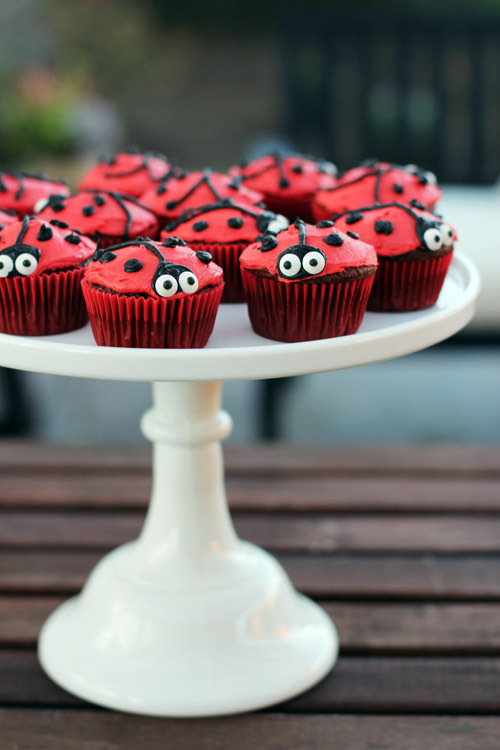 These ladybug cupcakes are seriously EASY. Cook the cupcakes in red or black cupcake papers. Make a batch of buttercream frosting. Color about 2/3 of it with red food coloring (you’ll need a lot of food color!). Color the rest of the buttercream with black food coloring. Frost the cupcakes with red buttercream using a butter knife, spreading the frosting on smoothly (doesn’t have to be perfect!). Place the black frosting in a piping bag with a small, round tip. 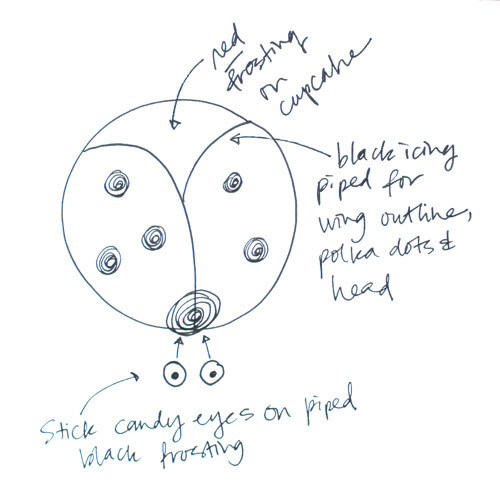 Pipe on the outline of the wings, the polka dots, and a head, as shown in the diagram below. Finish off the ladybug with small candy eyes placed on the black icing piped on as the head, right at the edge of the cupcake. I was able to knock these cupcakes out no problem, and the design is so simple even the non-artistic among us can pull it off.